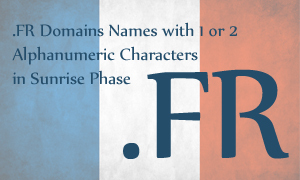 Beginning December 8, 2014, 1 and 2 character domain names under the French domain .FR will be in the Sunrise Phase which will end on February 9, 2015.
a, à, á, â, ã, ä, å, æ, b, c, ç, d, e, è, é, ê, ë, f, g, h, i, ì, í, î, ï, j, k, l, m, n, ñ, o, ò, ó, ô, õ, ö, oe, p, q, r, s, t, u, ù, ú, û, ü, v, w, x, y, ý , ÿ, z, ß, 0, 1, 2, 3, 4, 5, 6, 7, 8, 9, excluding the hyphen/minus sign (-). Domain names that are also excluded are: co.fr, tm.fr and nh.fr. Those interested in registering domains must adhere to the naming policy and other rules of the French domain registry. The Landrush Phase will start February 16, 2015 and end March 17, 2015. Any interested applicant can register a domain name consisting of 1 and 2 characters during Landrush. If you are interested in registering a 1 and/or 2 character French domain, please contact our Support Team at support@web-solutions.eu or via phone on +44 (0) 208 133 3994.